When the weather outside is frightful, what you need is a mug of something wonderfully wintery and warming. So that you can enjoy barista style drinks from the comfort of your own home, we've got some simple recipes for making your liquid festive favourites. For a warming tickle and a creamy start to those can't-feel-your-nose, chilly mornings. Serves 1. To make the ginger syrup, bring the sugar, water and ginger to the boil. Then reduce heat to a simmer and continue cooking for 45 minutes. Strain through a mesh strainer into a bottle. For the ginger latte, heat the Semi Skimmed milk in a saucepan or in the microwave. Then add 2 tablespoons of ginger syrup. Pour into your favourite mug and top with whipped cream and sprinkle with cinnamon. A sweet and spicy afternoon boost. Serves 2. First, place the vanilla, cinnamon sticks, Semi Skimmed milk and caster sugar in a saucepan with medium-low heat. Stir whilst cooking for 10 minutes until it begins to simmer (before it boils). Set aside for 10 minutes. Then, remove cinnamon sticks and return the saucepan with medium-low heat. Stir whilst cooking for 5 minutes. Pour into heatproof glasses and sprinkle with ground cinnamon. Press and crack the cardamom pods. Bring the water, cardamom and ginger to a boil. Simmer on low for 4 minutes. Add the Semi Skimmed milk and sugar (optional) and then stir in a pan. Add tea and bring to the boil again. Strain directly into teacups and enjoy. A winter warmer to curl up on the sofa with. Serves 2. 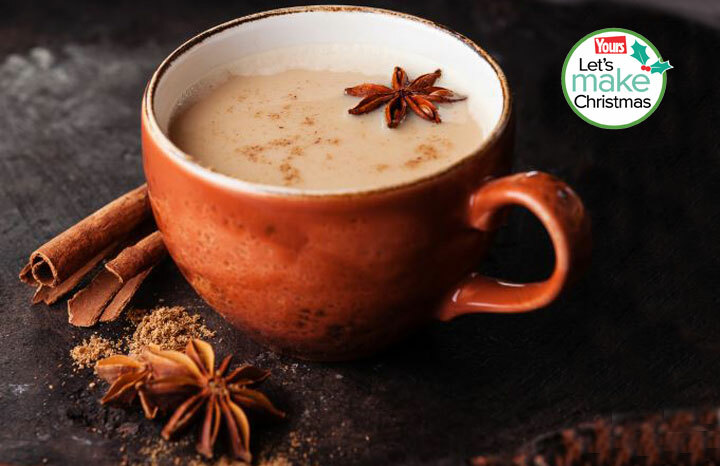 Heat the cinnamon stick, Semi Skimmed milk and red chilli in a saucepan with medium-high heat for 7 minutes. Set aside for 10 minutes. Place in a clean saucepan, discarding solids and heat over medium heat for 4 minutes (don’t boil). Reduce heat to low and add chocolate and whisk until smooth. Pour and top with whipped cream and ground cinnamon. There's more recipes and food ideas in every issue of Yours magazine, out every fortnight on a Tuesday.